For other places with the same name, see Krzepice (disambiguation). 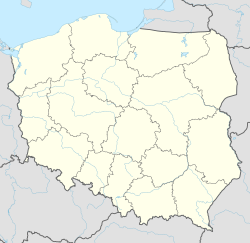 Krzepice pronounced [kʂɛˈpʲit͡sɛ] (German: Krippitz) is a Polish town near Częstochowa, in Kłobuck County, Silesian Voivodeship, in northwestern corner of Lesser Poland. It is located near the historic border of Lesser Poland and Silesia, which goes along the Liswarta river. A few kilometers to the northwest, Lesser Poland meets another historic province of the country, Greater Poland. For centuries, until 1793 during the Partitions of Poland, the town belonged to Lelów County of Kraków Voivodeship. Annexed by the Kingdom of Prussia as part of New Silesia in 1807, it was passed to the Duchy of Warsaw, and then Congress Poland. In 1918 it returned to Poland, and was part of Kielce Voivodeship. After World War II, Krzepice remained in Kielce Voivodeship until 1950, when it became part of Katowice Voivodeship. The town is home to a sports club Liswarta, established in 1946. The name Krzepice, mentioned for the first time in 1356 as Crzepycze, comes from a last name Krzepa; most probably, members of this family lived in the area of the town. In a Latin language medieval document of the Roman Catholic Archdiocese of Wrocław (Liber fundationis episcopatus Vratislaviensis), written in 1295-1305, Krzepice is spelled Crippicz antiquum. In the Middle Ages, Krzepice was a border town, guarding the northwestern corner of Lesser Poland. In the 12th century, a wooden stronghold was built here, then it was replaced by a wooden castle, which in the 14th century was rebuilt into a stone complex. Today, only parts of a moat is all that remains of the castle. In 1357, King Kazimierz III Wielki erected a parish church. Krzepice was most probably incorporated in 1357, but there is speculation that it had taken place in the mid-13th century. In 1370, King Louis I of Hungary granted Krzepice as a temporary fee to Prince Władysław Opolczyk. After a few years, the town returned to Poland. On March 15, 1552, King Sigismund II Augustus specified the boundaries of the town. In its center there was a main market square, with six streets, and with parish church of St. Jacob. Due to convenient location, near the border with Silesia (which at that time was part of Kingdom of Bohemia), Krzepice became a local trade center, with fairs, and three market squares. This corner of the Kingdom of Poland was located away from main military conflicts, and the town prospered, especially in the period known as Polish Golden Age. It changed during the Swedish invasion of Poland (1655 - 1656), when both Krzepice and the ancient castle were destroyed by the Swedes. Ruins of the castle remained until 1927, when they were finally demolished. The town frequently burned (1450, 1527, 1656, 1867, 1881, 1903, 1904 1906), which was due to its wooden architecture. In 1870, Russian authorities of Congress Poland reduced Krzepice to the status of a village, as a reprisal for its inhabitants' participation in the January Uprising. Krzepice regained its town status in 1919, when already it was part of Kielce Voivodeship of the Second Polish Republic. Krzepice used to have a large Jewish community before the onset of World War II, constituting 43% of the town’s total population. In early 1940, the Germans set up an open type ghetto there with about 1,800 inmates, along with Judenrat and the Jewish police. The Jews were forced to perform slave labor until the liquidation of the ghetto in June and July 1942, when most of them were sent in Holocaust trains to Auschwitz extermination camp. Those who remained were deported to the ghetto in Sosnowiec. Only a handful survived the Holocaust and subsequently left Poland. The stone-and-brick Synagogue in Krzepice, built around 1822, still stands although unused and in a dilapidated state. The historic Jewish Cemetery is close by. Main highway connections from the Krzepice include those with Wieluń (to the north-west) and Częstochowa (to the south-east) via the National Road 43. A bypass of the town was opened in 2009. Krzepice is linked by rail to Wieluń and Katowice. It has a rail station, on a line from Herby Nowe to Wieluń, built in 1926. ^ "History of the Jewish Community in Krzepice". Virtual Shtetl. Museum of the History of Polish Jews. Retrieved April 18, 2012. This page was last edited on 3 June 2017, at 16:51 (UTC).